This Monday marked the last day of the cake decorating series that I taught here in my home (we will have a makeup class, date TBD). What a great experience it was for me! I had a lot of fun sharing and helping others do things that most had not tried before. We covered mostly the basics of cake decorating and I tried to incorporate tricks and hints that I have learned over the last few years. All of the girls were great and such a pleasure to work with, I hope you all took something away from the class! I definitely learned a lot in regards to how much work doing something like this is and I know there will be some things that I take out/add for any future classes. Anyway, this was a lot of fun for me -- showing someone else how to do something is a great way of perfecting techniques and slowing things down a bit. I've had a few people ask me about future classes and I definitely want to do a few more. I would love to do a more advanced class for those who don't want/need the basic stuff. (or for those who just really enjoy working with fondant/royal icing). I know that I'm definitely going to do two cookies classes when the holidays roll around. If anyone is interested in more classes or starting a new class, please let me know! Even though this series was primarily for cake, the last week was all about cookies. I decided to throw cookies in because they are fun and it's something I really enjoy doing. While the girls were VERY QUIETLY working on their cookies (that's not a joke, it was so quiet in here you could hear a pin drop), I worked on a few of my own. A friend of mine (whose daughter was in my class) has decided to do a cherry blossom theme for her upcoming birthday. Anyone out there that knows me, knows that I just LOVE this idea. Cherry blossoms are a favorite of mine. 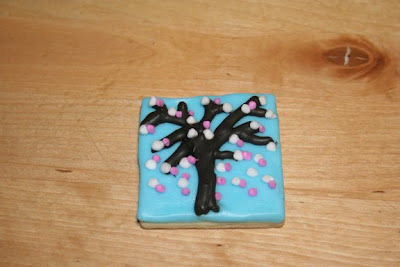 Anyway, I decided to make these cookies (I saw a similar design somewhere) because cherry blossoms were fresh on my mind that day. I love the way they turned out! I'm thinking of stealing this theme and using it for Rylee's birthday if only for the cookies! I planned on doing a silhouette cookie favor already (I always give out two packaged cookies as favors for her birthdays) and I think this cookie will pair nicely. I love the sky blue and pink, love it! *Next week brings a cake that I am very excited about. I think it's going to turn out beautifully (just so happens that I will be attending the soiree along with the hubster - which I'm sure will have me on edge the entire time up until they cut the cake, hooray for mixed drinks) and I'm very excited to get started on it! I love teaching classes too! So rewarding and so much fun!